Mark Jackson is a theoretical physicist working on 'Superstring Theory'. 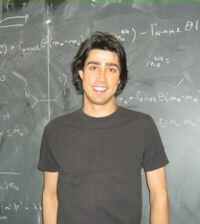 He is a postdoctoral researcher at the Lorentz Institute for Theoretical Physics in the Netherlands. Here is Mark Jachson's interview sent us by e-mail in which he tells us about his life and his work. Q: How and why did you decide to study physics and which is the best memory of your life as a student? I was always obsessed about asking why things happened. I loved tinkering with construction kits and especially electrical circuits, and had many, many questions for my parents! As I grew older and more passionate about really trying to understand the "bigger" questions, it was very exciting to see that some of these big questions could be answered, and to do this you used physics. In high school I took physics and loved it, and told my physics teacher that I wanted to major in it in college. His (well-intentioned) reply was that they had figured out all of the interesting stuff and there was really nothing left to do, and so I should study engineering instead - there were always new products that could be invented using these laws of physics! So I spent my first year in college as an electrical engineering student, but absolutely hated it. It was fine if one's interest in science was a 9-to-5 job where you were primarily concerned with getting a (profitable) product out the door, but it wasn't concerned with constantly trying to answer "why does that happen?". The summer after that first year I had a research job at NASA where I was around professional and student physicists for the first time, and it was immediately clear this was where I belonged. The first day back at college as a Sophomore I changed majors to physics (and additionally math) and I've been happy ever since. Q: Which difficulties did you have to face and what was the most exciting episode of your career? The toughest and most important thing a scientist has to do is get a good advisor; mine was a bit accidental. I did my undergraduate work at Duke University in North Carolina, and had never even heard of strings until my Junior year, when I did a research project with a really brilliant string physicist, Ronen Plesser. Though I knew nothing about strings Ronen was super-inspirational and I figured if someone as great as him was this excited about strings, it might be worth thinking about. When it came time to apply to graduate school I told him that I thought I might consider doing strings and he encouraged me to go to Columbia to work with a colleague of his named Brian Greene. This was a few months before Brian's book came out, so I had only vaguely heard of him because he had done a video math course with Duke. But it sounded good and so I arrived at Columbia later that summer after the book came out. Of course this meant that every incoming graduate student wanted to work for him, and I had to work very hard to "prove" myself that first year. But he did take me on as a student and I think it was a good match. Plus I was probably the only student who could see their advisor on The Colbert Report or movies like Frequency. Not too many students get emails from their professor discussing a technical paper we were collaborating on, and then a postscript at the end, "I'm going to be on David Letterman tonight if you happen to catch it"!The most exciting episode of my career was just as I was finishing graduate school. I got to visit the University of California at Santa Barbara for a few months, and happened to become involved in a collaboration involving cosmic superstrings. These are astronomically-sized strings which possibly formed in the very first moments of the early Universe but remain stretched across the sky. They oscillate at the speed of light and so emit a tremendous amount of gravitational radiation, meaning that we might be able to detect them in the very near future. Our research was the first calculation of how you might use these strings to learn about string theory, and so it's really exciting to think that we might soon see a string and then our calculations could be used to prove string theory! Q: What are you working at presently? I work on "Superstring Theory", and especially how we might determine whether it is correct based on cosmological experiments. String theory allows us to, for the first time, talk about quantum gravity in a precise way. Usually when we do physics we only consider quantum mechanics (small distances or low energy), or only consider gravity (big distances or lots of energy), because they don't work with each other. But this assumes point particles, and when we consider that these are actually just small strings, it turns out you *have* to have quantum gravity. This is a really importanttool because we know of two cases where we have to have quantum gravity to understand something: the center of black holes, and the first moment of the universe ('the big bang'). So string theory lets us study precise models of the first moments of the universe, which is a pretty cool thing to do. It also lets us study the universe as a whole (for example, maybe our universe is just a membrane in a higher-dimensional sea containing many other membranes). Q: Which do you believe will be the next discovery in physics? I think we will soon see a formulation of a "Grand Unified Theory", at least in basic form. Obviously we won't have worked out all the details, but it doesn't seem impossible that we could have the basic ideas down in the very near future. To see what this means, consider chemistry. People were very confused about why there are certain elements in the world, and why they have the basic properties they do. Then they developed the model of the atom with the electron moving in 'orbitals' around the nucleus and this immediately gives you the Periodic Table which explicitly tells you which elements exist and why they have their properties. Of course there are still details left to fill in, but once you have that framework, you at least know what you're talking about. Right now in physics we're still trying to figure out the "Periodic Table" of particles and forces, but I think this will happen in my lifetime, and that it will have to do with String Theory. Q: In your opinion, which is the best discovery ever and who is your favorite scientist? The best discovery ever is the thermos. When you put hot liquids in, they stay hot; when you put cold liquids in, they stay cold. How does it know? Just kidding. My favorite scientist is Emmy Noether, who made the best discovery ever when she realized the connection between symmetries and conserved quantities. Like all great discoveries, this is both incredibly practical as well as elegant and logical. When you're a beginning student and you only see the practical side of this in that the conservation of energy, momentum, charge, etc. let you easily solve problems, but it just seems miraculous that these things are conserved. You have to spend a few more years to learn *why* this is so - that there is a symmetry associated with that quantity, where by 'symmetry' I mean a mathematical operation which leaves the physics unchanged. A simple example is the symmetry of translation in space - if I did an experiment somewhere, and then moved it over a little distance, I wouldn't expect the laws of physics to be any different. This simple observation seems completely unremarkable, except that in mathematical form it implies the conservation of momentum! The analogous statement about time then implies conservation of energy. While these are fairly obvious symmetries, there are a variety of more abstract versions, and modern theoretical physics is actually really just the study of these symmetries. Thus it's not really an exaggeration to say that Emmy Noether invented physics as we think of it. Yet she has nowhere near the public recognition of Newton or Einstein. Q: How important is the collaboration in scientific research, especially among researchers from different countries? I work in a department with other theoretical physicists, but in a variety of specialties: mine is superstring cosmology, some do phenomenology (interpretation and parameterization of experimental results), astrophysics, alternative models of gravity, etc. I chat with them as much as I can to gain new perspectives on things, but it's completely flexible who I decide to work with. Sometimes I've found it's very useful to work with someone (since we both bring different tools and knowledge to the table) but sometimes I've found it's just faster to work on a project myself (since they might be very busy with other projects). Q: How can a scientist be defined and how do talent, intuition and study influence his profession? A scientist is simply someone who tries to determine the rules of how Nature works. Of course since mathematics is the language that Nature speaks, one needs to have a pretty high level of mathematical comprehension, but after that it can be done by several methods - guessing, intuition, study, deduction, and so on. The only rule is that you have to be honest about checking your ideas against reality. If your theory doesn't match reality it is wrong, despite how much you want it to be right. Regarding how talent, intuition and study influence his OR HER profession, it depends on that scientist. Often someone with great intuition will notice a connection between two ideas which don't have any obvious common thread, but they can' make this connection completely rigorous. Then someone with more technical talent can fill in the gaps and give the detailed picture. We need all types. Q: What are your hobbies and passions and what book would you suggest us to read? I have pretty ordinary hobbies and interests - I love movies (especially comedies), I'm a bit obsessed with Wikipedia, and I love traveling, (especially in Italy!). My favorite book of all time is "The Time-Traveler's Wife" by Audrey Niffenegger, I would highly recommend this to anyone - especially before the movie comes out later this year! Q: How do you see the future of research in this period of global economic crisis? The main cost of science is in building experiments - the theoretical physicists just need chalk, which is pretty cheap! Luckily the two big experiments relevant to my field are already built - the Large Hadron Collider and the Planck Satellite. The LHC should turn on in September (after a year's delay due to the malfunction last Fall) and Planck should be launched early next month. The vast majority of these has already been spent in designing and building them, once they are operating they are very cheap. So I think things in that respect will be just fine. The only concern would be how many new faculty positions will open up if Universities have reduced funds, either government funds or private endowments might both drop. But since students will still attend Universities, and they still need people to teach classes, I think this is going to be pretty stable.